Lots of folks have misconceptions about head lice and the people who have them. Head lice can affect anyone: rich or poor, young or old, male or female. An outbreak of head lice in your family does not mean that you're a bad housekeeper or that you don't bathe. It does mean loss of school for kids, loss of work time for parents, and the often unnecessary use and misuse of potentially harmful pesticide treatments. The sooner nits (louse eggs) and head lice are detected, the easier and quicker it is to control and remove them.... because they multiply quickly. This is the reason why the National Pediculosis Association® (NPA) recommends that parents screen their children regularly (several times a week) as part of routine hygiene. It's up to you to do it 4 the kids! To help with this screening process, the NPA has developed a medical device called the LiceMeister® Comb. Used on clean, damp and untangled hair, the comb is passed through the entire head of hair. If lice and nits are present, they will be collected by the comb. 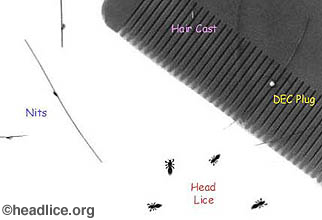 If you are not sure if it's lice or nits on the comb, refer to the Detection section. Proceeds from the LiceMeister® comb go to support the NPA's programs of research, education and prevention and allow the NPA to be independent, self-sustaining, and accomplish its mission. Head lice are clear when they hatch but turn reddish-brown as they feed on human blood. They are wingless insects. Adults are about the size of a sesame seed. 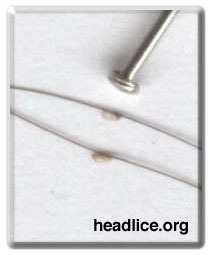 Nits (louse eggs) are small grayish-white, oval-shaped lice eggs glued at an angle to the side of the hair shaft. It is often easier to detect nits than lice because lice move quickly. Sometimes parents confuse nits with common hair debris. Ongoing problems with nits without ever seeing a louse, may signal misdiagnosis. For example, they may have found DEC plugs or hair casts, common forms of debris, instead. DEC plugs (desquamated epithelial cells) may occur when oil glands in the scalp work to compensate for the drying effects of chemical treatments. They are bright, white, irregularly shaped clumps of fat cells stuck to the hair. Hair casts are thin, elongated, cylinder-shaped segments of dandruff which encircle the hair shaft and are easily dislodged. A nit is a smooth, oval shaped structure which is attached to the side of the hair shaft ranging in color from off-white to brown and is big enough to see, but still very tiny. Nits are always the same shape; they are never irregular, fuzzy, or encircling the hair (although the glue that the louse produces may be seen to encircle tightly around the hair shaft). There are many products on the market that claim to kill head lice or remove nits. NONE of them are 100% effective. This often leads to parents using too much of a chemical treatment, or to using it too often. The NPA has developed a non-chemical medical device called the LiceMeister® Comb, which it endorses, because the NPA believes that the mechanical method of removing head lice with a comb is the safest and most effective method. The LiceMeister comb is not only an excellent screening tool but it also serves as a non-chemical treatment. An infestation can be ended by combing and removing all the lice and their eggs. Whichever treatment you choose, or choose not to use, you still need to get the nits out. Because chemical treatments do not actually REMOVE the nits, combing is the logical and practical place to start. 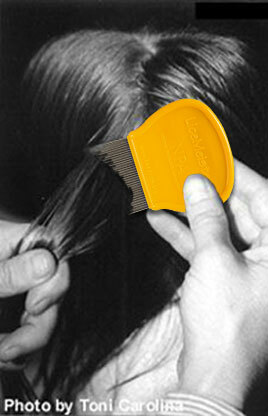 The LiceMeister® Comb is to be used on clean, damp and untangled hair. If hair is shoulder length or longer, divide and section off the hair with clips. Then, section by section, comb through the entire head. If lice or nits are detected, then grasp a one-inch section of hair at a time and place the comb against the scalp, pulling it completely through the hair from the root to the end. Clean the comb under running water, or dip it into a cup of water between passings to remove lice and nits from the comb. Hold it up to the light to ensure that it's completely clean before the next stroke. If hair is fine, you may want to apply inexpensive styling gel to assist with the removal of nits during the combing process. When lice and nits are present, hair should be combed at least twice daily and, if shoulder length or longer, pulled back and up in a braid or bun. This process should continue for 2 weeks after lice and nits are no longer found during the combing process. After this, you can resume routine screening by combing twice weekly. You need only one comb per household because the LiceMeister comb can be safely boiled if desired, whereas other combs may not live up to this claim. Consistent with traditional communicable disease control measures, the NPA emphasizes early detection as the best prevention. Parents who routinely screen their children for lice (several times a week) are being responsible members of their community. Sometimes screening allows parents to comb out lice and nits before they even know the child has them! Lice enjoy grown-up heads too, so parents should also take the time to screen themselves. The National Pediculosis Association's No Nit Policy is the public health standard intended to keep children in school, lice free and nit free. It is a positive approach focused on education and making informed decisions. It is about protecting children in a group setting by empowering parents with the tools and the knowledge they need to successfully keep their children in school lice free and nit free. It's also about educating and empowering children with things that they can do -- like keeping hair pulled back, never sharing brushes, combs or hats and being screened at least twice a week with the LiceMeister Comb. This teaches responsible personal health behaviors...just like brushing teeth and washing hands. Pediculosis represents one of the most common communicable childhood diseases and whether or not we understand how this has evolved, it is important to acknowledge head lice as a health issue when raising or caring for children. We can begin to improve the current situation by assuring that the health programs of every school, camp and child care facility operate with an acceptable head lice management protocol.